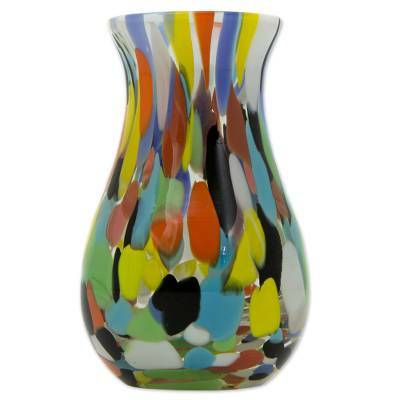 Hand Blown Multi-Colored Murano Inspired Art Glass Vase, "Impressionist Spring"
Artisans of the Seguso family craft a signature blown glass vase with spectacular impressionistic dabs of color. They take their inspiration from the legendary art glass created on Murano Island in Italy, and add a unique Brazilian touch. 11 cm H x 7 cm Diam. 4.3" H x 2.8" Diam. You can find art glass vase 'Impressionist Spring' by Seguso Family in vases categories such as Art Glass Vases, Modern Vases, Handblown Vases, Murano Vases and Glass Vases. Enjoy exploring these sections for other Novica treasures.